Red Zen was meant to be a noodle bar and I recommend you try their noodle meals. All the seven varieties on their menu looked interesting and the three we ordered turned out very good. We took a table indoors. Since they haven't gotten their liquor licenses completed sorted out, we ordered cocktails. The chef soon sent a complimentary amuse: a nice little wonton in sweet chili sauce and slivers of onion and tomato. 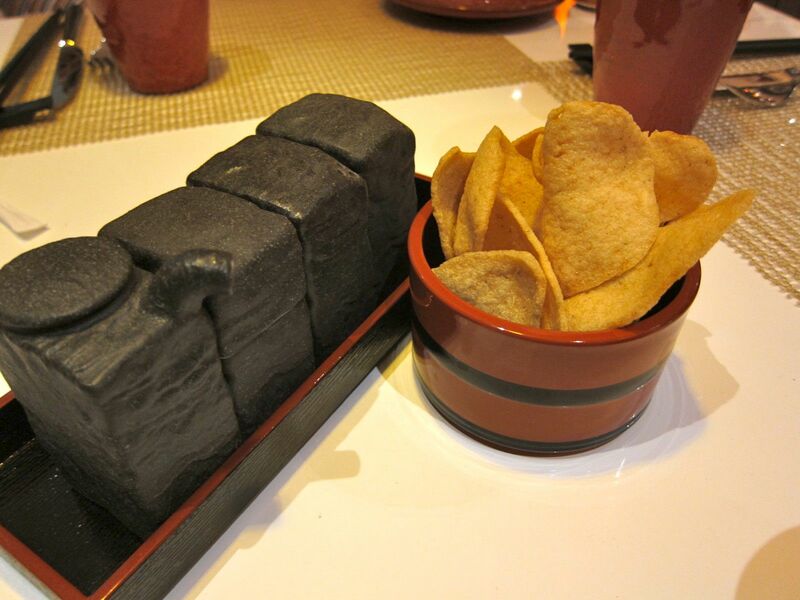 They also put some prawn crackers in front of us. 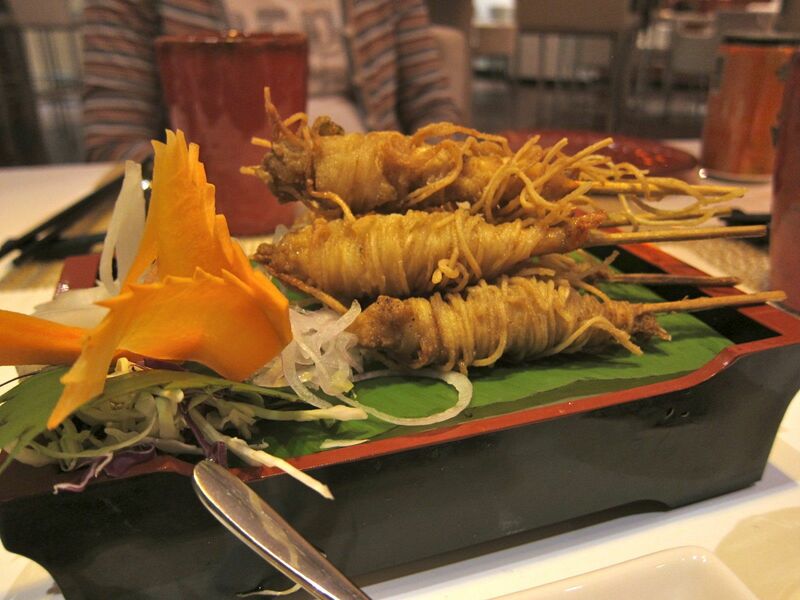 We began with an appetizer of Goong Hom Sabai, deep-fried prawns wrapped with noodles that was served with plum and sweet chili dips. 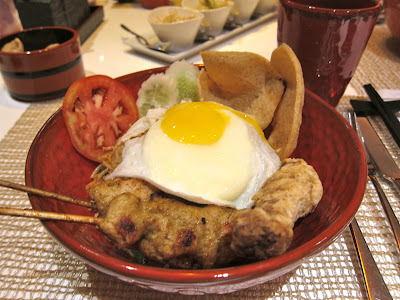 I had asked for the Mee Goreng, a complete Indonesian meal in a bowl consisting of stir-fried noodles, chicken satay, Ayam Goring - Indonesian fried chicken, kroepoek - Indonesian crackers with a fried egg on top and served with a spicy sambal. 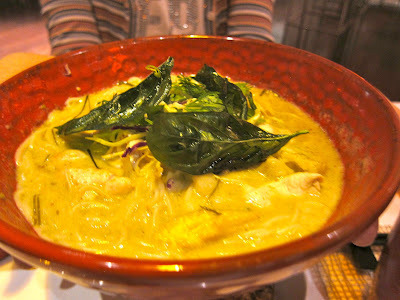 My wife decided to try the Khanom Jeen Gaeng Kiew Waan Gai, a bowl of Thai rice noodles served with chicken green curry. 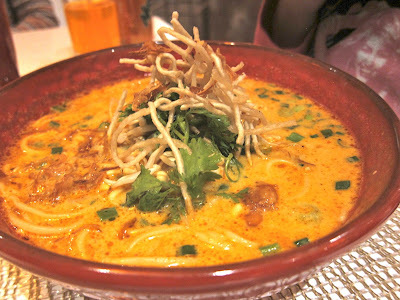 My daughter ordered the Laksa, one of my favorites. Laksa is a popular Malaysian noodle soup made with prawns and coconut milk and is served with a variety of toppings including chill, crisp fried onions, florets of cauliflower, sprouts, etc. 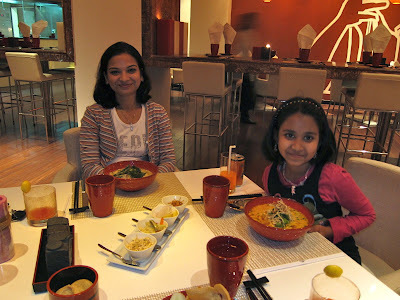 All three noodle meals were quite delicious and completely filling! Please remember these dishes are a complete meal by themselves. In spite of being quite full, we had to try our favorite dessert in Thai restaurants, Tub Tim Krob. 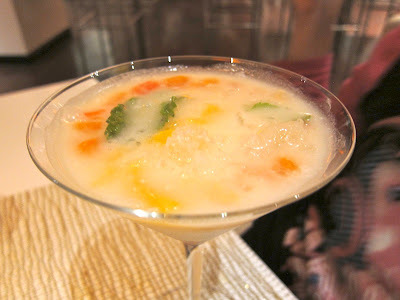 This lovely dessert was served to us in cocktail glasses: red rubies of water chestnut mingled with crushed ice in cold and sweetened coconut milk. 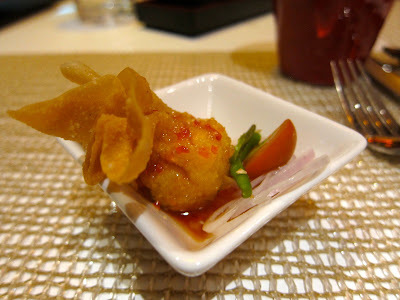 They also brought us a variation that included lychees and ripe jackfruit along with the water chestnuts which I loved even more. Service was excellent throughout with the young waitstaff eager to please. Given the quality of food on offer (and at reasonable prices too) I would have expected more people here on a Friday evening. I guess the hotel is new and its restaurants haven't been discovered by many of the local foodies yet. @Lakshmi: Good to see you back here. Likewise, have been following your Twitter feeds from your travels within the country.